Dunking biscuits is one of life's guilty little pleasures. There are many people that think that dunking a biscuit in a drink is bad manners....oh, what sad little lives they must lead! Whether you dunk in a glass of milk, a cup of tea or a mug of hot chocolate, a biscuit seems to take on a completely different taste and texture. These gingernut biscuits are just perfect for dunking. They have a wonderful flavour and the additional of a little orange rind gives them a little extra something. 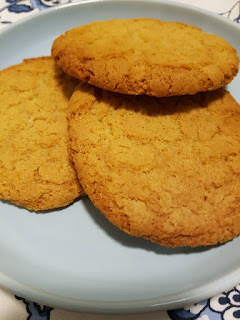 You can cook them at the lower end of the cooking time for a biscuit that is crisp around the outside and chewy in the middle or cook for the longer time and have an all over harder and darker biscuit which is closer to the commercial variety. 1. Line baking trays with baking paper. Preheat oven to 160 degrees. 2. Place butter and golden syrup in the bowl with the knead blade. 3. Select Sp 4, 80 degrees,, 3 min. 4. When program is finished place all other ingredients in the bowl. 5. Select Pastry P1 for 1 min. After 30 seconds, stop program and scrape down sides. Resume program. 6. When program is finished, roll dough into balls slightly larger than walnuts. Place on trays, 3cm apart to allow for spreading and flatten the balls slightly with your fingers. 7. Bake in the preheated oven for 15 - 20 minutes. 8. When cooked, allow to cool on trays for 5 minutes and then transfer to a cooling rack. HINT - when measuring golden syrup, spray the utensil you are measuring it with, with cooking spray. When you tip it out, it will slide out easily without leaving residue. These look delicious! Thanks so much for posting your recipes. Any chance you know how many teaspoons/tablespoons 70g of golden syrup is?